Bear with me. This post has been updated a few times since June 2012. The goal was to keep track of what we plant in the garden AND to find a way to keep the dogs out of the garden. Just about everything we planted (summer 2012) from seed came up – except the zucchini. Lesson learned? Don’t use use seeds that are two years old. Whatever. Fennel – this is our first year planting it – will keep you posted . . .
Peas – for shoots and to eat! The garden is about 16’x32′. We use mostly organic seeds and plants and shy away from pesticides. I don’t usually keep track of how much I spend to plant the garden but I did this year. My friend and I shared seeds and some plants. I only spent about $8 on seeds and another $30 on plants. That’s a pretty small investment for the amount of fresh produce we’ll get from the garden. 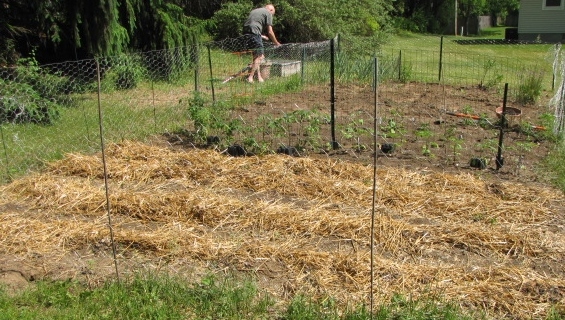 Our philosophy is to plant a lot of stuff but in smaller quantities or in short rows (about 8′). The exception is tomatoes. What we don’t eat fresh, we will freeze or use to make sauce. In 2011 the garden produced until the middle of December – the broccoli just wouldn’t die!!!! I figured that from mid-July through October, the amount of produce we harvested saved us at least $25/week, if not more. Bonus? We know where our food is coming fun and it’s fun and easy. This year we decided to put up a fence that we could easily take down before winter. Why? Because my brother-in-law, Paul, stops by a few times a week with his black lab who weighs about 80 lbs. so that our dogs can play. I’m hoping the fence keeps the two beasts out of my garden or we’ll be eating dog stew with our fresh veggies!!! The fence took us about an hour to put up and was cheap and easy to do. 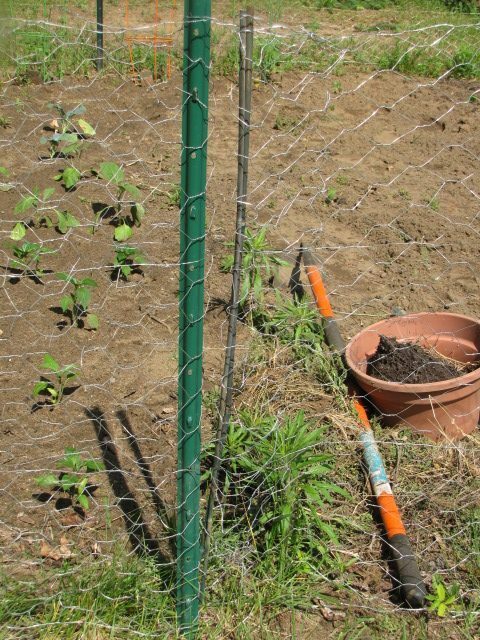 You’ll need two 24″x 50′ rolls of chicken wire (about $5 apiece), a package of 24 – 4′ bamboo stakes (about $5), 6- 4′ metal stakes ($3 each). Just put a metal stake in each corner. Save the remaining two for the gate. 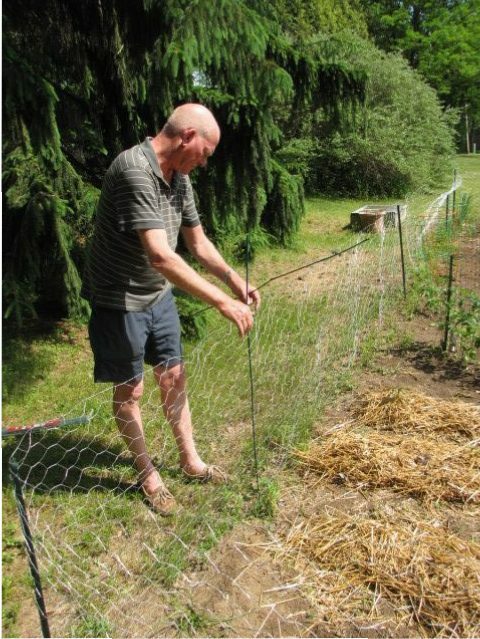 Stretch the chicken wire around the garden and place bamboo stakes evenly around the perimeter. That’s it! A view of the corner. Super easy to install. To take down, we’ll just pull the stakes and roll up the fence. The fence is high enough to keep the dogs out but low enough for me to step over. Our not-so-fancy garden gate. Not pretty, but it works! Fast forward. We successfully used the fence for four summers. We would take it down at the end of every summer, store it in the shed, clean it off in the spring and put it back up. At the end of last summer, the fence was pretty rusty. 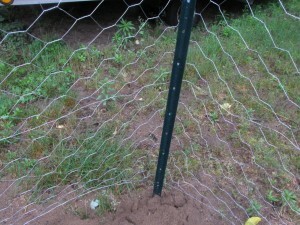 This summer we replaced the chicken wire. We went with 36″, instead of 24″. We also moved the opening from the end to the side and figured out a better way to create a ‘gate’. Am not sure I like the taller fence yet because I can’t just step over the fence when I want to. I’ll know by the end of summer. Either way I’m happy with this low tech, low cost fence solution. We found that making the taller fence look less ‘wavy’ was a bit more challenging than it was with the 24″ tall fence. 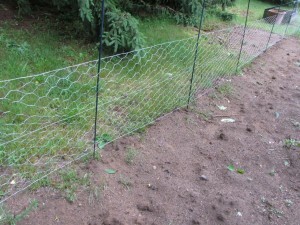 Straightening the fence – section by section. We plant the same things pretty much every year. The straw in the pics is our potato patch. Next to that are tomatoes. We’ve also got garlic, cucumbers, onions, herbs, swiss chard, peas, lettuce, green beans, eggplant, broccoli, bell peppers, jalapeno peppers, zucchini and butternut squash. Don’t laugh but I planted pumpkins in my flower beds in front of the house! Can’t wait to see how that goes. 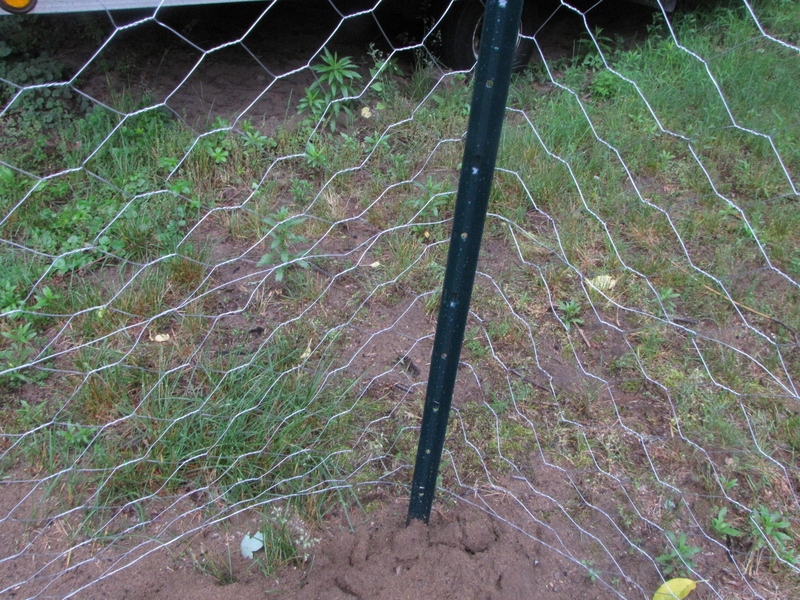 To close the fence gate, we just push the bamboo stakes into the wire on the left at the bottom. Below is the loop Mark made that goes over the top of the post on the left. Contact me if you have any questions about how to put up this fence or if you have a garden question. Kim…LOVE THIS! How do I pin just this article on my gardening board on Pinterest? I found your board but could not find this one…. Hi! I’ve been planting a raised bed garden for 2 years and trying to figure out a cheap, easy way to keep my 2 big dogs out of it. This fence looks doable but I can’t quite see the details for the gate. I don’t need anything fancy, and I don’t mind stepping over but my kids like to help (and I like them to help!!) so a “gate” would be ideal. Can you give me some instructions on that part of it? Thanks!! Good question. I hope this makes sense. 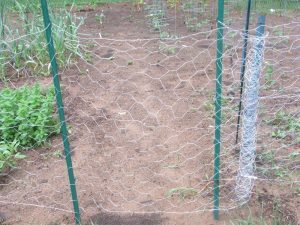 With the extra that was left over at the end of the roll of chicken wire, we just kind of wrapped it and bent it around the opening. You can use a bamboo stake to secure it. It’s kind of ‘cobbed’ but it works for us. Yes. It works like a charm to keep the dogs out. 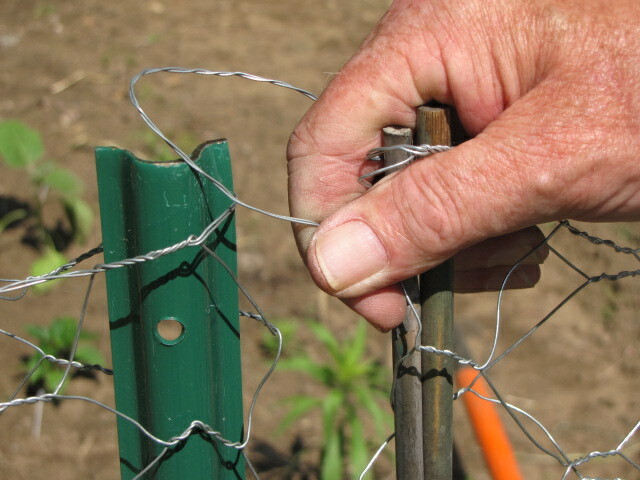 To keep it stretched tight, place the metal stakes deep in each corner, then place metal stakes as needed. 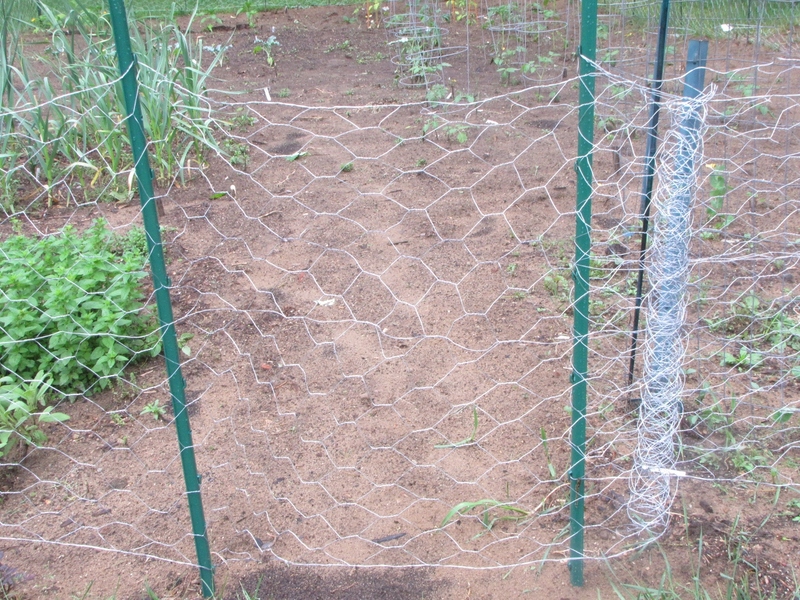 Stretch the chicken wire tightly between the metal stakes. The bamboo stakes help but the metal stakes are what really keep it tight.